The "average" cannabis consumer is often characterized as someone younger than 30, but new research shows that might not be the case. There are many misconceptions about the average cannabis consumer. We are frequently characterized as being of a lower socioeconomic and education level, under 30 years old, and that we smoke just to get high — with little to no regard for the plant’s medicinal properties.Now that more states and countries are legalizing marijuana for recreational and/or medicinal use, people’s attitudes about the once-demonized plant are shifting. People are seeing through the myth that weed is a gateway to dangerous drugs like cocaine and heroin. They’re finally questioning the fallacy that cannabis's addiction potential is equal to that of alcohol, opioids, and cigarettes. A recent study conducted by three researchers, William Kerr, Camillia Lui, and Yu Ye, revealed some pretty interesting statistics about the “typical” cannabis consumer. The only age group to show a rise in consumption were those individuals aged 40 and older. Between 1984 and today, the usage among 18 to 29-year-olds hasn’t changed much. By contrast, during the same 35-year period, usage among people aged 40 and older rose approximately 11 percent. Although the conclusions point to an increase in use, I contend that all it exposes is a disinterest in being counted prior to laws changing and attitudes toward pot use relaxing. Just because these consumers fell off the radar of those tracking their use doesn’t indicate they necessarily stopped using. I interviewed five people age 46 and older about their cannabis consumption. They’re from different corners of the globe, and a variety of different places, some where cannabis is legal, and some where it is still illicit. Bob lives in Washington State. Although California was the first state to legalize marijuana for medicinal use in 1996, Colorado and then Washington were the first states to legalize recreational use of the plant in 2012. Bob’s use predates legalization. He’s been using it for the last “20 or so years.” Bob uses weed to treat pain as well as for pleasure and spiritual reasons. Joe likes cannabis for his occasional aches and pains and because it helps him sleep. Many consumers report the positive outcomes strains high in THC have on insomnia. Joe doesn’t use any of Big Pharma’s treatments. Weed is legal for both medicinal and recreational use where he lives in Washington State. Joe also likes getting high. His friends and family are supportive of his using. He noted that he has friends who don’t drink because they’re friends of Bill W'sand either smoke themselves or are supportive of Joe using cannabis. He told me his sister owns a bar and she is behind him 100%. His daughter — who also works in a bar — concedes cannabis is better than drinking. Joe started smoking in the 1960s. He’s also several times gone a decade or more without consuming cannabis. Joe wished I had asked him whether I thought weed is a healthier alternative to alcohol. He also wished I had asked about marijuana’s influence on a relationship versus that of alcohol. To date there have been no deaths caused by cannabis alone. On top of that, if the approved indications list in states where marijuana is legal is any indication, cannabis is the clear winner in a two-team race between itself and alcohol for actually treating anything. While non-consumers can and do frequently take note of consumers being couch-locked and even what I like to call “stuck on stupid,” unlike alcohol, violence is not a by-product of cannabis use. I know I am far more agreeable and easier to get along with when I’m stoned, and on the few occasions I have been drunk in my life, I couldn’t say the same. Tina uses cannabis (which she has to cop illegally from someone she’s trusted for years to get the strains she likes) recreationally and medicinally for 28 years, but primarily medicinally since she was 23, so for 23 years. She uses cannabis to aid sleep, relax muscles, ease chronic pain from osteoarthritis, calm depressive periods and panic attacks, calm neurons firing in her brain (epilepsy), and to help delay treatment for her form of cancer (a rare type of treatable leukemia). Unfortunately, while her supplier is trustworthy to get the strains she likes, this person is not always reliable, which means sometimes she has “breakthrough” symptoms until she can get her hands on weed. Tina is out with everyone she knows: friends and family. Her work colleagues and supervisors are fully aware and are supportive of her cannabis consumption. I asked her if she’d been willing to cease all consumption if it were causing problems in her personal or professional life. She said she would if it meant losing her job, but that by going off she’d be unable to work full time, so the point is moot. Tina regularly blogs about this and other topics related to advocacy of marginalized people. April smoked as a teenager and stopped when she was 20. In 2005, her husband gave her weed to help reduce stress and related insomnia. She was was convinced of its safety and efficacy from the first time she used it as an adult. New Jersey legalized medicinal marijuana in 2018 after governor Chris Christie left office. April couldn’t be happier her state is “just inches away from legalizing weed for recreational use.” Her friends and family support her decision to use it, with one exception. She doesn’t flaunt it in her 92-year-old mother’s face. She says all in her work crew use it either medicinally or recreationally, and in the 25 years of being a registered nurse, she has never once been tested. I smoked very briefly as a teenager. I might have continued using, but my middle brother overdosed on cocaine mixed with PCP (angel dust) when I was 15 and he was 18. Like a great many people of my generation, I was raised on anti-drug slogans like D.A.R.E.and former first lady Nancy Reagan’s “Just Say No!” Both of them touted pot as a gateway to more dangerous drugs like cocaine and heroin. My parents used my brother’s OD as an opportunity to warn me that the same could happen to me if I continued smoking pot. If it weren’t for the fact that I write a lot about addiction, I probably wouldn’t have realized the gateway myth and the so-called ‘War on Drugs’ was propaganda started by former president Richard Nixon as a way to incarcerate African Americans. My “aha moment” occurred a couple of years before Puerto Rico legalized marijuana for medical use by executive orderin 2015. My doctor and I were concerned my continued use of Vicodin to treat chronic pain and migraines exposed me to liver damage. I had been using it for about 25 years after I fractured my back when I was 18. Although I never developed a dependence or addiction to it, liver damage was a real concern. My doctor is what I’d call a country doctor. If she can find a treatment found in nature, she prefers to advocate its use over the ones manufactured in a lab by Big Pharma. She alerted me as soon as cannabis was legal on Puerto Rico and said I should get my card. Once I was legal, I stopped using Vicodin. It’s been almost two years since I filled a prescription for Vicodin. In this time I have successfully treated my chronic pain, migraines, and insomnia. Although I got lega permissionl to use it (flower, oils, waxes, suppositories, and occasionally edibles) for those indications, what I have found interesting is that I no longer have asthma and my panic attacks have been reduced from several a day to a couple a month. 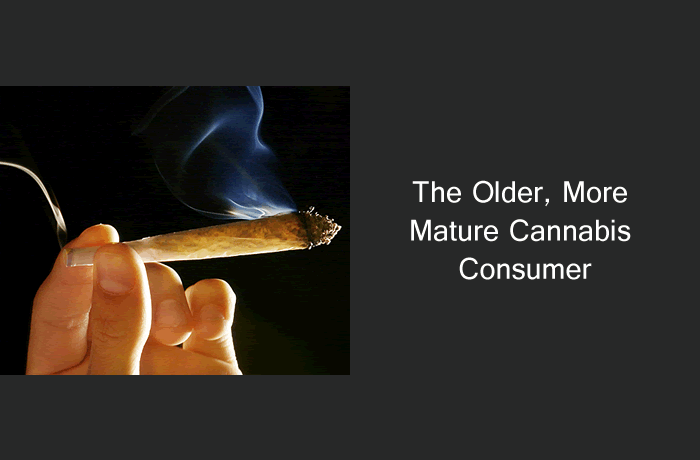 I believe two things account for the uptick in cannabis use among middle-aged people and up. Many never stopped using it but because it was illegal, they just didn’t admit to it. The other is, despite the vilification and lies about weed, its medicinal properties are many and have likely been enjoyed by people for around 3000 years. I think it’s pretty clear to anyone who does their own research that cannabis is far more safe and efficacious than most everything Big Pharma throws at us. This article was originally published on Merry Jane and is republished with permission.